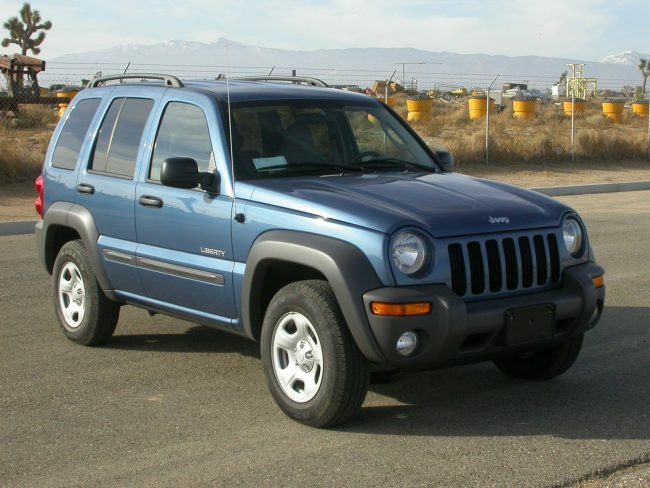 Over all, I like my Jeep Liberty but I have had a few vehicle problems during my 106,000 miles. Some were manufacturer defects and a few were just wear and tear. The first problem that I encountered was the tail lights. I used to go thru light bulbs as often as every three days. What I finally figured out is that the plastic inside the tail lights was touching the bulbs. The heat from the bulbs touching the plastic inside the light fixture caused the plastic to melt to the bulbs and they would break the bulbs—probably due to vibration—and the bulb would need replacing. Over a series of months, I used needle-nosed pliers to break out all the loose plastic inside the light fixtures. Once all plastic was removed, the bulbs worked properly. The braking system was made using cheap parts. I had to replace rotors and pads after a few off-road trips. They go too hot and warped like crazy. Also, the rear window motor on the driver’s side went out. The dealer charged $400 to replace it. I have experienced the infamous key getting jammed in the ignition and not being able to remove it. This appears to be a frequent complaint of Jeep owners. I found many complaints on the Internet. My latest adventure began with turning the ignition key and not being able to start the vehicle. Then the next time I would try, it would start right up. The last time this happened, my Jeep ran fine for two weeks before giving me trouble again. The only thing I noticed was that I had to turn the key as far as it would go and it would then start. The key movement was not right. Well finally this week-end, it just died on me. I went to the local auto parts store and they advised me that intermittent problems—especially electrical ones—were the worst. The advice I was given was to bear with it until something failed completely and check the Internet for others experiencing similar problems. Well, yesterday evening, the key mechanism failed completely. There was absolutely no resistance when I turned the key. Whatever happened, the break in the ignition system was no longer intermittent. When this happened, two lights on my dash board and the radio came on. I knew from reading the Internet that I needed to disconnect the battery until the issue was repaired. I went only the Internet and found this entry. 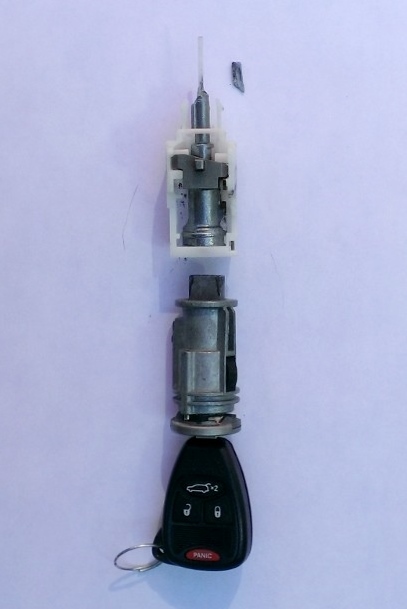 http://www.jeepforum.com/forum/f9/ignition-switch-pin-actuator-repair-1378503/ The problem that I experienced was the actuator pin assembly was broken. The URL above described my problem and it includes a link to a video on how to remove and replace the broken part. The vehicle in the video, however is a PT Cruiser and not a Jeep. I would like to explain the differences between the video and the Jeep Liberty. First, the housing around the steering column is attached with two T-20 screws. They are recessed in two square holes on the bottom side of the cover, closest to the steering wheel. The top cover has some wires attached so it must be pushed out of your way. Next difference from the video, the assembly for turn signals, wipers, etc. that is shown with T-20 screws in the video, just sits on top of two pegs on the steering column. You need to remove three T-10 security screws to complete the disassembly. One screw is in the starter switch. This is the square box on the left side of the steering wheel with lots of wires running to it. The actuator assembly has two screws holding it in place. I found a small mirror came in handy when looking for the screws. I could remove them without crawling under the steering wheel. Once I removed the assembly and inspected things, I noticed that the metal portion of the actuator was broken-off where it goes into the ignition switch. I required some needle-nosed pliers to remove a broken piece of metal from the switch. For some reason, I was unable to locate a second piece that was broken off of the actuator. In total, it took ten minutes to locate the tools and remove the actuator assembly. I am writing this blog while waiting for the part to be delivered from the warehouse to my local auto parts store. The part arrived from AutoZone an hour earlier than promised. Aligning the key cylinder with the actuator was a pain. It took several attempt to get it aligned. Once both pieces are inserted into the steering column, you do not get all key movements. You get both Off and a large, slushy On zone. After the ignition switch has been installed the movement gets better, but not until the actuator cover is screwed in place will you get all the proper key positions. Please note that the spring that must be installed with the cover must be correctly aligned or the cover will not fit over the actuator properly. Also, the tiny pin in the cover kept falling out and I had to hunt it down at least twice on the carpeting of the vehicle. I hooked up the battery and the Jeep started just as it should. Then I had to program the radio and clock and now I’m back on the road. Cost of my part was higher than the Internet prices. Including tax, I paid $44.27. Elapse time was less than an hour.